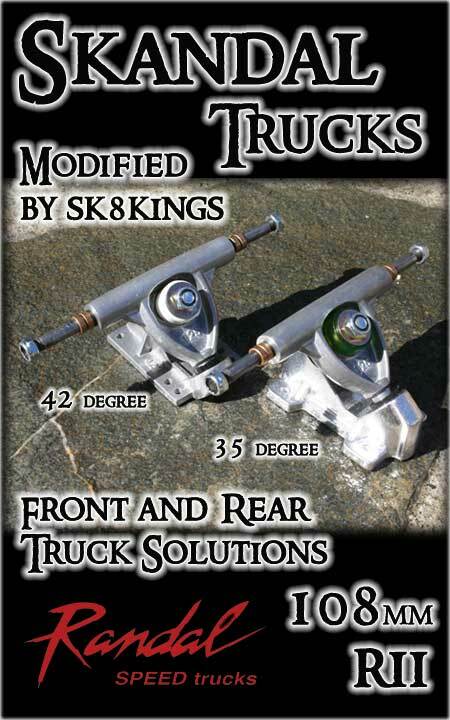 Customized Randal II Trucks with traction in mind. Thanks to the folks at Randal Trucks -- with some SK8KINGS magic touch modifications to their new RII 125mm hanger size -- the final product adds high performance traction at reasonable cost. After milling down the hanger to a 108mm size, matched with the 35 degree baseplate and a complete bushing overhaul -- these babies are the bomb for your rear traction truck. Comes equipped with 1/8" steel axle spacers, speed rings and premium customized bushing combo. Axle spacers are intended to be used to fine-tune your wheel placement on the available axle length (ie: typical set up - 1 speed ring, wheel, 2 1/8" spacers, axle lock nut). Specify weight and intended discipline in notes section when ordering for our use in selecting proper bushings. Skandal Front Truck Option: For an "all Randal" ride -- the Skandal hanger can be configured for turny front with the 42 degree baseplate -- to pair with the Skandal 35 degree in the rear. Specify your choice of baseplate when ordering. Another option for a performance and budget-friendly front truck match up -- consider the Skennett (Mod'd Bennett). We recommend agressive wedging for performance. BUSHINGS: Reflex or Venom Bushings upgrade available. Choose option when ordering and specify any duro preferences in Notes section. BACK UP BUSHINGS: New bushings are essential for top performance. Order a backup set for your truck and replace before you race.